I am back from no wi-fi world!!! Not being able to surf, blog, print off postage for the pile of stuff that recently sold, do listings, etc. etc. etc.- it is crazy how much stuff you do with technology and the internet these days! I found this petite beauty at a yard sale years ago. It was being used as a step up for a travel trailer. So there it sat- outside and it had tons of muddy grungy feet marks on it. Not a pretty site for a little dainty antique footstool. But it was a fantastic little size and so so darling! Carved wood and little feet- loved it right away! I grabbed it and took it home with me and cleaned it up. so used that for now- not sure it is staying. It's a bit glam & fun! I placed it underneath one of my favorite old chair frames. It is a reddish wood that has been stripped so it has a bleached appearance. We found it at a flea market and I have not even attempted upholstery on it. I love the simple beauty it has. & I love the elegant details and curves! the little footstool fits perfectly underneath! Off to catch up with all of you and read your latest posts! I too, have a little leopard footstool. In fact, I have 2 of them! The round one I have has a braided rope trim, too! 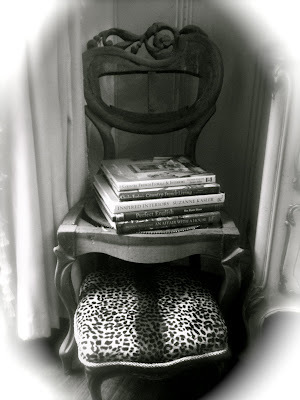 I love the vignette you made with the chair, try, books and stool! You lost your WiFi for a while and I lost my car last Friday to the mechanic for a new radiator and tie rods. So I know how you feel! Give Bella a kiss fo me, will ya? Did I say Iwas glad you're back yet? oh I love it! Leopard = swoon!!!! Bella looks quite content upon her throne. You've managed to combine your fabric, trim and stool to create a winning combination! Looks fab.! Love your pics. The footstool is adorable in leopard! Bella looks like she has claimed it as hers. I also love the chair with books stacked on it. 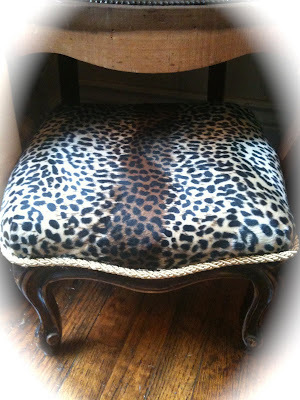 LOVE THE FAB AND GLAM MAKE OVER YOU GAVE YOUR BEAUTIFUL FOOT STOOL :) BEAUTIFUL!! AND THAT CHAIR IS FABULOUSLY CHIC!! So pretty and great fabric. You got a bargain in that stool. They are expensive at the flea markets here. oh I love it. Love it! What a great makeover on the stool. I absolutely love that chair. It looks great the way you have it all arranged. Something about its nakendness that is really appealing to me! I likey...you did a wonderful job reupholstering it! 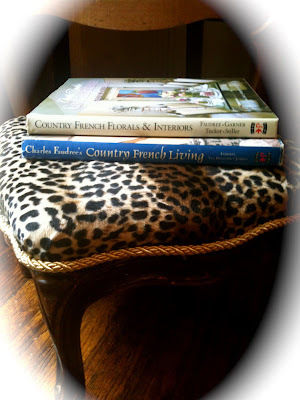 That foot stool is favulous as us ladies say.It is so fun to redo our treasures. Hi Courtney! What a jewel you found, I cannot imagine mis-using this lovely little stool. You really brought it to life, just beautiful! Thanks for linking up with VIF! Oh my gosh, one word... GORGEOUS. I am a total sucker for animal print. Love how it looks paired with the chair and books. Well done! Visiting from Stories of a House. I'm with Lori. I LOVE animal print! You did a very professional job recovering it. I love the lines! Thanks so much for linking to Project Diaries. 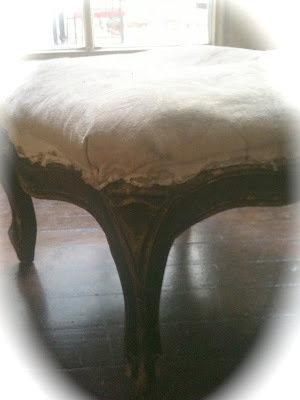 That footstool has WONDERFUL "bones" and the way you've restored it is simply gorgeous. So happy to see you for Sunday Favorites, sweet friend! I just loved this post...so glad that you shared it with us for the repost party...I missed it the first time around. 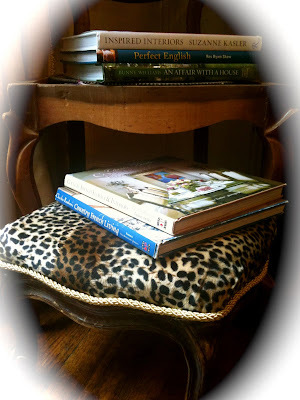 Well my dear...your little antique footstool is just sooo cute and I love the leopard print that you chose to use on it...simply exquisite! 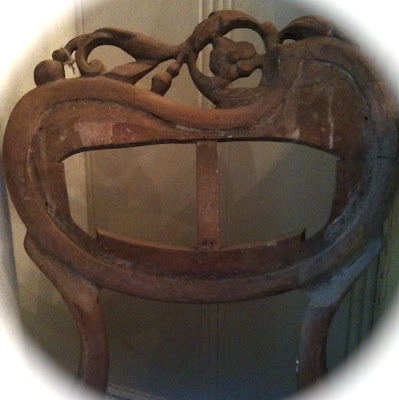 Ohhh...and how very beautiful is that lovely old antique chair that you found! I love the carvings on the back...really unique! I think that using your newly redone footstool with the antique chair is fabulous...they make a perfect pair! I love it! Thank you for sharing this sweet post with us, Courtney! You always inspire me! 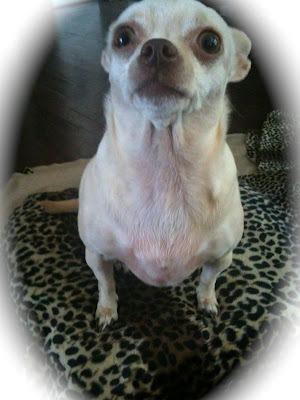 I also wanted to thank you for the warm welcome back...so very sweet of you! Eeeks...I'm having trouble getting back into the swing of Blogland! Hopefully I can get a post together for your Friday party!